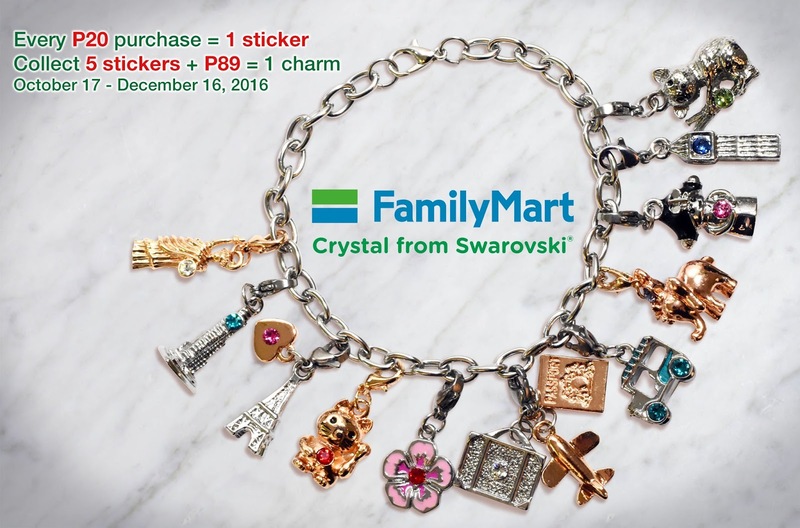 Popular Japanese convenience store chain, FamilyMart, launched its exclusive Swarovski® Charm Collection featuring icons from Japan, New York, the Philippines and other top destinations Pinoys favor. FamilyMart always caters to the needs of its customers by offering high-quality products, delicious value for money meals, and friendly service. By giving customers this chance to collect delicately designed Swarovski® crystal-encrusted charms, FamilyMart just makes every store experience even more rewarding. Customers of FamilyMart have the chance to get the charms at up to 90% off their actual retail price. Joining is simple… every P20 purchase entitles customers to a sticker. Once your collect 5 stickers, just pay P89, and a charm of your choice is yours, it’s that easy! Choose among the different designs available like the Philippines’ Jeepney, Japan’s Cherry Blossoms, France’s Eiffel Tower and more. Snap Card holders can get a bonus sticker by simply presenting their card with every purchase. The Swarovski Crystal Charm collection makes for a perfect gift for the women in your life, this Christmas. So what are you waiting for? Head on over to FamilyMart and get your charm collection now! Promo runs until December 16, 2016.Per DTI FTEB SPD Permit No. 9564 series of 2016. FamilyMart is the 2nd largest convenience store chain in the world with over 18,000 stores across Asia. In the Philippines, FamilyMart now has over 100 stores with branches in Makati, Ortigas, Quezon City, San Juan, Manila, Mandaluyong, Marikina, Fort Bonifacio Global City, and Cebu. For store locations or more information on FamilyMart Philippines, log on to www.familymart.com.ph or find us on Facebook under FamilyMart Philippines or Instagram at @familymartph.